You may currently have that excited feeling that arises in the planning stages of your holiday/adventure. You’ve definitely asked yourself what area of the world you would like to see, what style of accommodation you’re interested in and which activities you want to fill your days with. As a staff member here at Zen Surf Morocco I can tell you I asked myself all those questions while choosing where I would like to work over this winter season. I also had that excited feeling during the researching and planning of my work adventure, day dreaming about places I had seen in photos of this far away and magical place called Morocco. My decision to live and work in the Taghazout Bay was based on the great proximity to many surf breaks and the broad cultural experience available. In the three weeks I’ve been here the faces have changed but there is a common balance remaining and that is the positive attitudes and excited energy of our visitors. 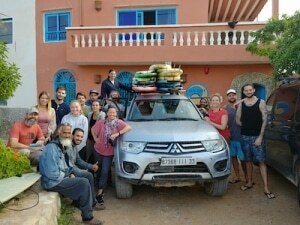 What a pleasure it is to spend my time with people that have traveled to really live and enjoy their days in this wonderful place.Whether you are visiting Zen Surf Morocco on Banana Beach for one week or one month, be prepared to meet some of the most amazing people you could ever find. 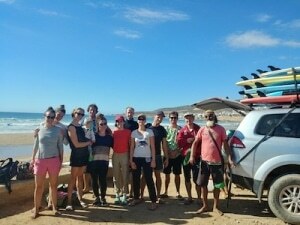 I’m thrilled to welcome you over this surf season!